The Compulsive Reader: Cover Talk: Behold, Lola! Okay, so for those of you who have been reading this blog in the past couple of months, you'll know that if you want a fabulous romance, I'll steer you directly to Anna and the French Kiss by Stephanie Perkins. It truly has everything you could ever want in a YA romance, and it's set in PARIS. J'adore ce livre! 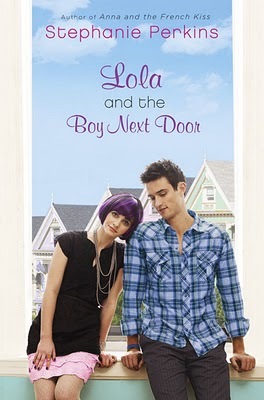 So, naturally, we're all on pins and needles in anticipation of Stephanie's next book, which is called Lola and the Boy Next Door ! And today when I got on Twitter, lo and behold, the cover was revealed! Ah, I love it! I love the purple hair and the background (San Francisco? Oh my, who do we know that lives THERE?) and the font...it's just all so perfect! That guy is really cute... but I'm kind of disheartened that the cover SHOWS us what the characters look like. I prefer to picture them in my head, but these characters look cute. Love the purple hair! I haven't read Anna yet, but I love a yummy romance! I think Stephanie Perkins is going to be writing must-read love stories for a long time, and I can't wait for this one!